Properly boxed and packaged regular 12x12 square Saltillo clay tile stained brick red (color may vary from picture). Sold per piece. It is one piece per sq. 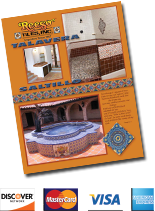 ft.
Saltillo comes in various sizes and shapes, please contact us for more details.